Heavy storms hit the Sepang International Circuit today as round 10 of the FIM Superbike World Championship got underway with Voltcom Crescent Suzuki’s Alex Lowes and Randy de Puniet claiming seventh and eighth in the free practice times. A steady start to the weekend saw Lowes conclude the morning practice comfortably inside the top-10 – his 2’05.806 best set on 15-lap old tyres and already improving on his last year’s race pace. 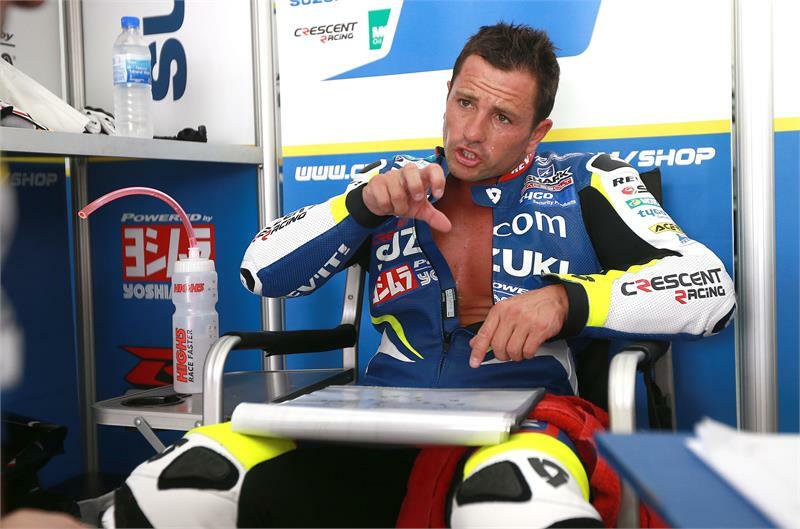 Pleased with his opening 45-minutes, the British racer aimed to focus his attention on fine-tuning his Yoshimura-powered GSX-R’s chassis balance, gearing and engine brake for the afternoon session, before a lingering midday deluge interrupted plans. Waiting as the Malaysian track dried out, Lowes left the box with just five minutes remaining of the second free practice. Confident enough with the GSX-R’s rear feeling to set the second fastest time of the afternoon with a 2’12.5 on wet rubber, before a practice start on his way back to pit lane. A similarly strong start saw Randy de Puniet’s time of 2’05.920 place him adjacent to his team-mate in eighth for the opening session. The afternoon plan – to concentrate on rear grip for the expected increasing temperatures and testing the new Pirelli option front tyre with his Suzuki GSX-R1000 – put on hold as the waterlogged track took the majority of the final practice to dry out. However, the Frenchman remains confident with the progression for the remainder of the weekend. The first of two free practice sessions sees Lowes and de Puniet return to the Sepang circuit at 09:45hrs local time (02:45BST) tomorrow, with the Superpole qualifier on track at 15:00 (08:00BST). Sepang – eni FIM Superbike World Championship – Free Practice Combined Times: 1. Max Biaggi (Aprilia) 2’04.823: 2. Chaz Davies (Ducati) +0.149: 3. Jonathan Rea (Kawasaki) +0.559: 4. Tom Sykes (Kawasaki) +0.668: 5. Leon Haslam (Aprilia) +0.710. 7. Alex Lowes (Voltcom Crescent Suzuki) +0.983: 8. Randy de Puniet (Voltcom Crescent Suzuki) +1.097.